"Not having been selected for jury duty, I've often wondered what happens in the jury room when they retire to reach their verdict. Having read this book, I have reached the conclusion it is nothing like it was portrayed in the 1957 film Twelve Angry Men staring Henry Fonda! It is very different from where my imagination had taken me - the courts pick 12 random people from the electoral roll - place them in a situation which will be a totally alien environment, compounded by the fact that the language that is used by both prosecution and defence councils can be baffling. In the past I have spent a lot of time sitting in Crown Court as a part of my job. I've observed an awful lot of jurors in that time and have noticed by reading their body language that some appear to be bored and almost nodding off, others are gazing around the room with blank expressions on their faces and there are those too who will be continuously looking at their watches, or doodling on their notepads. Some will be obviously struggling with the complexities of the case, no matter how the judge might attempt to guide them through the evidence. Unfortunately, this is just the tip of the iceberg. In my ignorance I had not considered that there were far worse scenarios and the author is very knowledgeable regarding these situations. 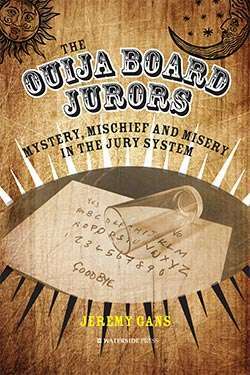 The book examines the case of a jury in a murder trial who used a Ouija broad trying to contact the deceased. In another case a jury member was discovered texting her boyfriend in the public gallery - he was informing her of what had been said in court when the jury was sent out to allow the defence or prosecution counsel to discuss points of law with the judge. It is against the law to question jury members about their deliberations. If a jury returns a unanimous verdict of guilty, and then later in the Court of Appeal the verdict is overturned the jury members do not have justify their reasoning, unlike judges and magistrates who, if they sentence outside the sentencing guidelines will have to put their reasons in writing. This book - The Ouija Board Jurors - written by Jeremy Gans is an excellent read - both for the layperson with little or no knowledge of the courtroom and the more experienced professional as it provides a different window through which we see our system."